Tacoma Washington (February 11 2014 ) – It was a successful weekend of racing for TireBlocks fun flat systems, with racers earning wins in both the Pro ATV and Pro UTV events. 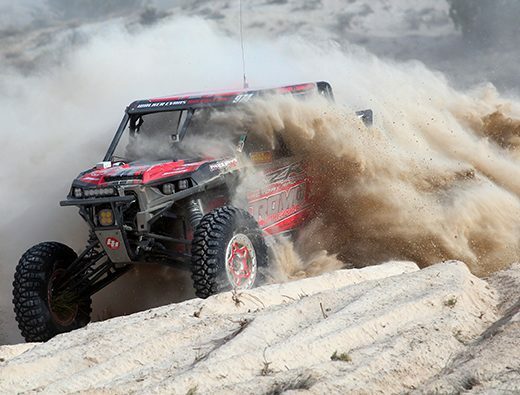 With one of the largest turnouts to date, the UTV race was once again the premier racing event of the weekend at Round 2 of the WORCS series in Primm Nevada. Tireblocks/H&M racer and reigning champ Beau Baron looked to improve upon his 13th place finish from round one but unfortunately, would have to do so by starting from the second row. That meant traffic could be an issue and Baron could easily get hung up behind slower cars in front of him and fail to make up enough time on the leaders. From the green flag, Baron drove like a man possessed and managed to pass numerous cars during the 45 minute race. Despite never actually taking over physical first place, Baron managed to claim the win on adjusted time, and equally as important, earn himself a front row starting position for the next race at Lake Havasu Arizona, a notoriously single lane track. In the side by side 1000 class, Baron’s teammate David Haagsma secured his second win of the season in his new TireBlocks/Polaris XP1000. Haagsma raced a modified RZR 570 last year and seems to be having no trouble adjusting to the bigger vehicle. 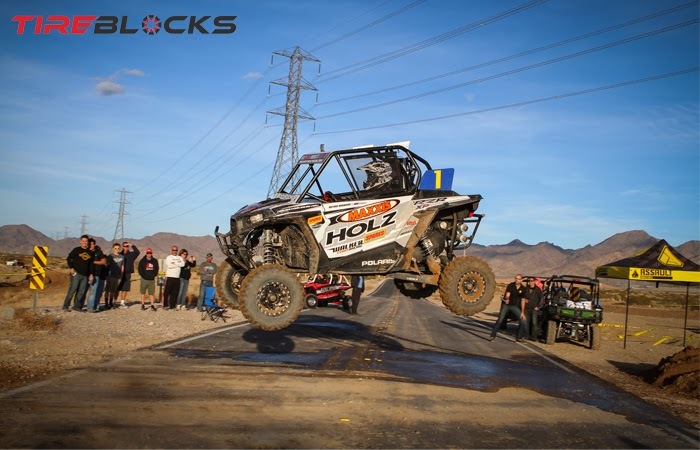 Tireblocks has impressive representation in the Pro ATV class and was poised to make a clean sweep of the podium until disaster struck for Can-Am/Tireblocks racer Dillon Zimmerman. “I was running fourth for awhile then made my way up to 2nd place,” said Zimmerman. “I only had a lap and a half left to go with a comfortable gap from third then I noticed my front tire wobbling. I was so bummed I tried making another lap to get to the pits but it fell off before then.” He would end up with a 6th place finish on the day. Zimmerman’s misfortune opened the door for reigning champ Beau Baron to move into the second spot behind his H&M teammate David Haagsma. Haagsma managed to ride virtually uncontested for the majority of the race to claim his first overall of the season. Despite winning two Quad X motocross championships, a professional WORCS title has eluded him and Haagsma is working hard to make 2014 his year. In the Amateur ranks, David Flores managed to dominate the Production A class on Saturday, winning by a margin of nearly 45 seconds. Unfortunately the Tireblocks/JRiShocks/Lonestar racer struggled with seat issues again and would settle for 2nd place in Sundays Pro-Am race. After two rounds, Flores continues to lead the class in the points battle. TireBlocks is the newest name in runflat technology for ATV’s and side by sides. Comprised of high density, ultra durable foam, the blocks allow an ATV or UTV tire to maintain its shape and rigidity in the event of a puncture. TireBlocks have been tested in a variety of conditions and are used by amateur and professional racers as well as recreational and utility riders. For more information contact info@ridetireblocks.com or visit them on the web at www.ridetireblocks.com or at facebook.com/tireblocks.